There’s the easy way… and then there’s the best, right way. My wife has always known the difference between the two. And ninety-nine times out of a hundred, she has chosen the right path over the least-difficult road to take. She is still making the best, right choices. Even now. Joey loves her some George Strait. She always has. He’s her go-to guy whenever she puts on a cd and is cleaning the house or driving her car. And when romance is in the air, it’s not Michael Buble’ or some crooner that she wants me to put on… she wants king George. And I am more than happy to oblige. A love-affair with a singing cowboy who lives a million miles away in her dreams seems safe enough for me. Heck, I think there are really only two or three men out there that I would’ve had to worry about being jealous of…. George, Robert Duvall and Tommy Lee Jones. The last two are because of the movie Lonesome Dove. My wife and I have watched ‘Gus’ and ‘Woodrow’ make the long cattle-drive to Montana a half-dozen times or more over the years. And she gets that look in her eyes when she watches that movie. She’s enamored by those men. By that lifestyle. Joey loves real cowboys. I don’t know why she loves me. She could’ve had any cowboy she wanted…. could’ve had the western life she dreamed of as a little girl riding her first horse Velvet. But she didn’t choose some handsome Marlboro man with a Sam Elliot mustache and a thousand-acre ranch… instead, she chose our little farm and she chose me. And I’m a long way from a cowboy. We do have horses now…well, the two that I got for Joey for her birthday this last fall (though she and I only got to see them a couple of times before our lives took us back to the Cancer Center in Atlanta and then here to her hometown in Indiana). And unfortunately, she will never get to ride those or any horses again. They will instead be grazing in the pasture around the family cemetery in the back field behind our farmhouse, where my bride will soon rest. It is difficult for me to write this, partly because it seems like everything I write these days ends up as some tragic news story about my wife and her ‘last days’ and the ‘shocking’ new development that has just been shared. I want to apologize for any sensational headlines that this or any post has created. That has not been my intention. These are just stories… small vignettes from our lives, just like the ones that you and everyone out there are living every day. That being said, I am thankful. So very thankful – that our story has been shared and shared and shared. Thankful that because it’s being picked up and shared by dozens of news organizations and hundreds of thousands of individuals on Facebook and elsewhere, somehow my wife’s life and ultimately her death, might possibly help or encourage someone else somewhere. That this life she’s living might impact the life of someone that she and I will never meet, and never see, at least this side of heaven. That is a good thing. No, that is a great thing. Thank you. The other reason it’s hard for me write this is because it has been so long coming on. Sometimes I feel like the boy who cried wolf. We’ve been here going through this for months and months now. Though many ups and downs. Nearing the end, doing better, nearing the end again. Hoping. Praying. Believing. But through it all, most of us have known down-deep for awhile now, that the end would eventually come… but we haven’t really faced it. I don’t think we’ve been in denial, just filled with hope and living in the moment. Because though you know that your loved-one is dying… somehow you find a way to find the good, even in the dying. You say to yourself…. she’s still here. We’re still together. And it’s still life. Sort of. But not really. This isn’t the kind of life my wife would want to be living. Not if you know her. Joey has done all she set out to do… even right to the very end, and by sheer will-power (and God’s grace), she was still here to to see our baby’s 2nd birthday. Over the last number of weeks her pain had gotten worse and her health had continued to decline rapidly. And not long after Indy’s birthday my wife decided that ‘enough is enough’. She was ready to stop fighting and she told me so. She said the flowers would soon be blooming back in Tennessee. It’s time to go home. Joey gathered her family together around her and she said goodbye to each of them… to her mother and father and her three sisters. There were lots of tears as she explained to each one how much she loved them and that she was going to be going home soon. That her time here was done and she was going to go to sleep soon. And then she asked me to bring our baby in. 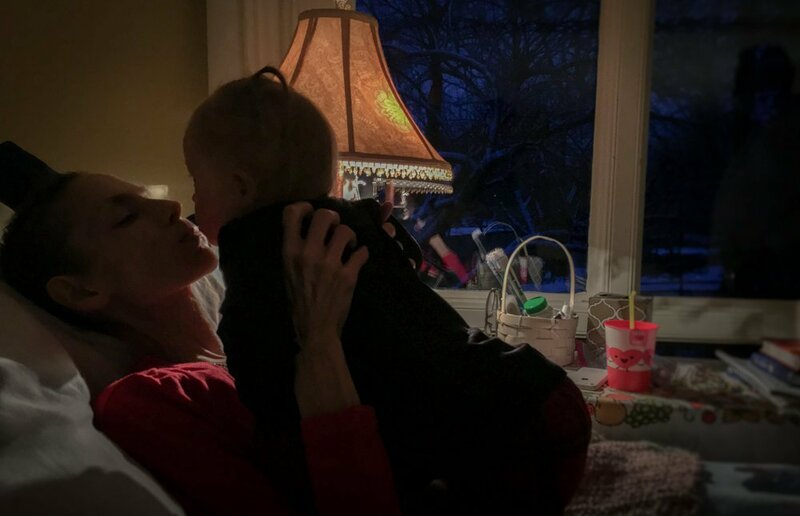 And so… I set our little Indy on Joey’s lap and we all cried with my wife as she told her how much her mama loved her and, “…you be a big girl for your papa… and that mama will be watching over you”. And then she pulled Indiana up and she kissed her. My wife has been asleep for days now and her body is shutting down quickly. The hospice nurse came again this morning and said Joey will most-likely only be with us for a few more days… at the most. A few more days… In the 40 short years that Joey has lived, my bride has accomplished many great things… she’s lived a very full life. But even more than that, she has loved those around her greatly and been loved greatly in return. I can honestly say that Joey’s isn’t just a life well-lived, it’s a life well-loved. God only gives each of us a certain amount of time to be on this earth and every day when we wake up, we get to decide how we are going to spend those precious minutes and hours. There are no do-overs, no second-chances, no next-time-around’s to get it right. Joey knew this and she has made each and every day count. One of the last things Joey said before she drifted into the deep sleep she’s been in for a few days now is, “I have no regrets… I can honestly say, that I have done everything I wanted to do and lived the life I always wanted to live”. In the time that God gave her… I believe Joey’s given all she could give. She’s loved all she could love and lived all she could live. And her faith… yes, it’s strong enough to save her. I know she’s done Him and all of us proud… in the time that He gave her. When we were at the Academy of Country Music awards in Las Vegas a few years ago, George Strait was there for a presentation and we were backstage with a group of folks, standing right in front of him… maybe ten feet away. They were giving him some sort of award, and I was encouraging Joey to go say hello. She didn’t want to. So I took her hand and walked her over closer to the small crowd that surrounded him until George and Joey’s eyes met… then George smiled and shook her hand, and she smiled back at him. I thought it was a special moment. But it wasn’t. At least not for her. Afterwards, I could tell that it wasn’t what she wanted. She didn’t just want to meet her hero, she wanted to earn his respect and meet him then, only then. She wanted to meet him ‘the right way’, or not meet him at all. I love that about her. “Cowboy, you get to stand on the same stage as her. I saw you in Walla Walla a few years ago. You were at Clarette’s Restaurant. You were just two normal people at a small booth, in a small town country diner. I was across from you. It was so obvious. It was American love……and it did not need to be interrupted. I smiled as I left, thinking, “That’s what it’s all about.” A couple famous folks, who probably don’t care about the fame. It reminded me of what George Strait must look like. Just a real person, enjoying taking his beautiful wife out for breakfast, and damn the attention. Like a real cowboy, it’s a way of life. Everything is in the moment, and beauty rises to the surface. What you’re doing, how you are sharing, how you have put frustration, hurt and what must be some anger aside, is the weight only something a real cowboy could shoulder. It’s the American ideology, like the “So God Made a Farmer,” Dodge Ram commercial, in the Super Bowl a couple years back. You’re that American man. That man/dad who can shoulder a burden. Thank you Jim, whoever you are. And thank you to all who have followed my wife’s beautiful journey. Who are still following. Though our hearts are heavy we all need to do our best to remember that this is not the end. It’s only the beginning.